Young handsome man standing on the pier near the fence and using smartphone near the water, browsing the Internet. 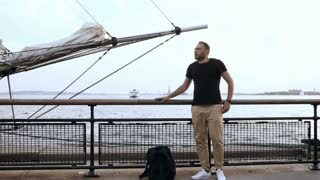 Young handsome man with backpack standing on the pier near the water close to bowsprit of the ship and looking around. Reading in the nature. Woman reading a book while standing at the bar on the pier by the sea.